KDE is a free software community full of diversity and, as such, we foster several meetings and welcome people from all over the world. 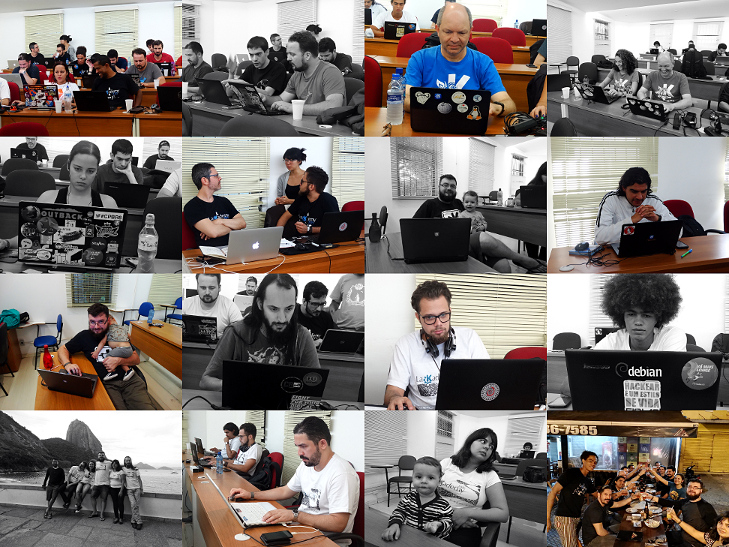 The 4th Latin-America KDE Summit (LaKademy 2016) took place from 26-29 May at Federal University of the State of Rio de Janeiro (UNIRIO), Brazil. Since 2014, LaKademy has become a yearly meeting (it happened every two years since 2010) and that has proven to be a quite important step to create a "sprint culture", narrow the ties with the global community, and better support newcomers. In every new edition, old LaKademy participants are more experienced about how sprints work and, therefore, more skillful in the task of guiding newcomers through their way into the Free Software world. This year, LaKademy brought together eighteen KDE fellows from Brazil, Argentina, and Peru ‒ interested in contributing to development, translation, artwork, promotion, and sysadmin. Contributions have covered projects such as Cantor, Minuet, Umbrello, BRPrint-3D, Plasma widgets, Plasma Network Manager, and color themes in breeze-gtk, as well as a revamp in pt_BR translation infrastructure/workflow, the creation of docker images for building KDE applications and the automation of KDE server configuration. Filipe and Fernando did a quite comprehensive bug triage for Cantor and worked on improving the Sage backend and fixing some bugs on Python3 and R backends. Wagner started investigating the use of CERN's Root project as a new Cantor backend. Henrique worked on his script for converting colors in GTK themes. The goal is to support GTK themes with any color scheme defined in Plasma, in addition to the already existing Breeze and Breeze Dark GTK themes. Lamarque helped Lays with compiling VTK as a Qt5 plugin (for use in BRPrint-3D), investigated some bugs in Plasma Network Manager and submitted a patch to a bug in libQt5Qml. He also helped Lays and Ronnie with doing their QML coding for BR-Print3D and porting KPeg to QML, respectively. Enoque ‒ who was attending his very first LaKademy ‒ worked on the development of new Plasma widgets for interacting with Phabricator and also did the first steps towards the implementation of an Android version for Akregator. Ícaro started the development of a new application for teaching Control Theory as a car race game. He worked closely with Gabriela Shima, a designer who joined us during LaKademy and helped with the game UX inception. Sandro focused on some architecture refactoring for Minuet and helped Ícaro and Enoque in their tasks during LaKademy. Lays did some bug fixing for Umbrello, as part of her Google Summer of Code project, and took the chance to do some improvements in the QML UI for BR-Print3D. For the first time ever, LaKademy had a small group devoted to do sysadmin tasks. Nicolás and Rafael worked to get KDE infrastructure configured using Ansible, starting with teleirc (bridge between IRC and Telegram) and created some docker images for easing the build of Cantor and other KDE applications. As for translation activities, Camila, Aracele, and Fred worked hard on reviewing package localization, came up with a proposal for a new software for managing the KDE glossary and analyzed the use of the Brazilian standard vocabulary. Camila and Aracele also worked on the creation of a LaKademy pre-meeting checklist and post-meeting metrics. On Saturday morning, we had the traditional promo meeting, where we discuss all sort of actions to boost KDE presence in Latin America, review our current practices, find out ways to improve it, and plan how to widen our community in the continent. The promo meeting is usually a quite exhausting time, but it has proven to be worthy since we are today more focused, organized, and compelling when doing promotion, handling finances, and supporting newcomers, just to mention a few benefits. As the outcome, we got a reviewed and up to date todo list with a lot of work to be done in upcoming months.